The body of a young girl is discovered in a field of wheat. Her flesh mutilated by telltale claw marks. The Wolf has broken the peace. When Valerie learns that her sister has been killed by the legendary creature, she finds herself at the center of a dark mystery, one that has plagued her village for generations. It is revealed that the werewolf lives among them, and everyone in the village immediately becomes a suspect. Could her secret love Peter be behind the attacks on her town? Is it her betrothed, Henry? Or someone even closer to her? As the men in the village hunt for the beast, Valerie turns to her grandmother for help. She gives Valerie a handmade red riding cloak, and guides her through the web of lies and deception that has held her town together for so long. Will Valerie discover the werewolf's identity before the town is ripped apart? This is a dangerous new vision of a classic fairy tale, the happy ending could be hard to find. 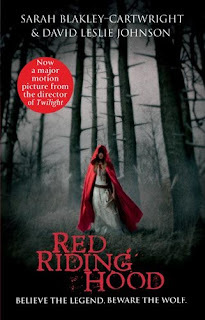 This book is a retelling of the story of Little Red Riding Hood. The author has taken the story and made it their own and pulled it out to be a compelling and exciting read. The story itself is quite dark. It revolves around a village which is being hounded by a wolf who demands regular sacrifices from the community. These normally take the form of farm animals and satisfies the werewolf problem until the next blood moon. However one time something goes wrong and the wold starts what be...moreThis book is a retelling of the story of Little Red Riding Hood. The author has taken the story and made it their own and pulled it out to be a compelling and exciting read. The story itself is quite dark. It revolves around a village which is being hounded by a wolf who demands regular sacrifices from the community. These normally take the form of farm animals and satisfies the werewolf problem until the next blood moon. However one time something goes wrong and the wold starts what becomes the beginning of a killing spree with Valerie, the main character's sister, dies. The village is up in arms and are thirsty for revenge. The thing I liked most about the book is the setting. I loved how you got a real sense of what life was life for the families living in the village. You can see how the ever looming threat of the wolf has changed how their live their lives day to days. I liked the main character Valerie. You really feel for her because she lives her life feeling second best behind her sister and when she is killed she feels guilty that it wasn't her instead. She has been betrothed to a man who she has no interest in marrying, which is made worse when man she wants to be with returns to the village. As the story progresses the village start to get more and more worried about the wolf threat, especially when more deaths occur. In the end a priest who is an expert in hunting down werewolves arrives in the village to help rid them of them of the problem with the startling revelation that the wolf could be anyone of them. All in all a fab book which is a brilliant retelling of a classic fairy tale. I now can't wait to see the film. This book sounds really intriguing and the movie looks good too (even if it is directed by the Twilight director :P) Thanks for the review! Hmm. I think I'm going to be incredibly naughty (and in some ways I can't believe I'm writing this..) and just go see the film. Yes, and skip the book! Sounds great! I really want to read this one, although I have heard that you have to go to a website to read the ending. Not sure if that's right? !